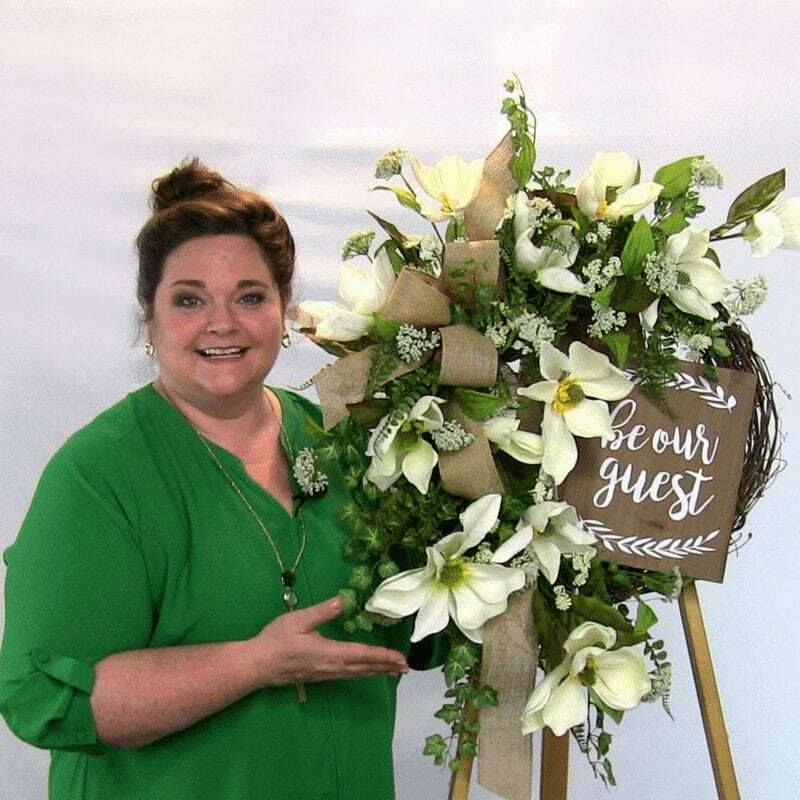 Learn to make a stunning Southern Magnolia Wreath! 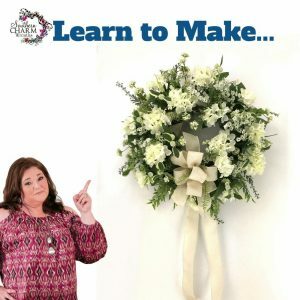 Have you’ve been dying to learn how to make a beautiful magnolia wreath for your door or even how to make a half moon silk flower wreath? Then you’ve come to the right place and I have all the answers! 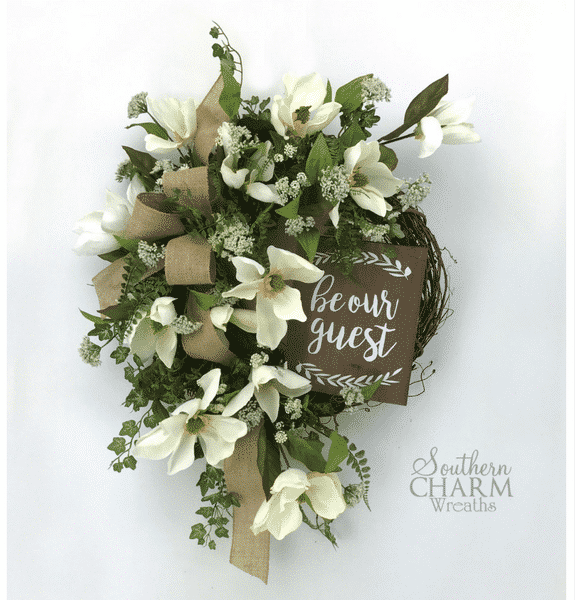 This wreath is filled to the brim with flowers, greenery and a casual burlap bow…can’t get more southern than that! Can you? 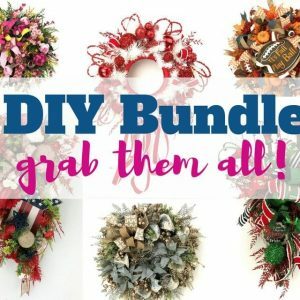 You’ll be so excited with your finished wreath, you’ll want to show it off to all your friends and neighbors! I know it can look intimidating but you will quickly see how easy it is with my step-by-step, detailed instructions on how to make a wreath just like this one. 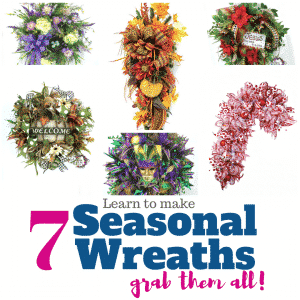 I show you exactly where to place each stem and how far they should come out of the wreath base. 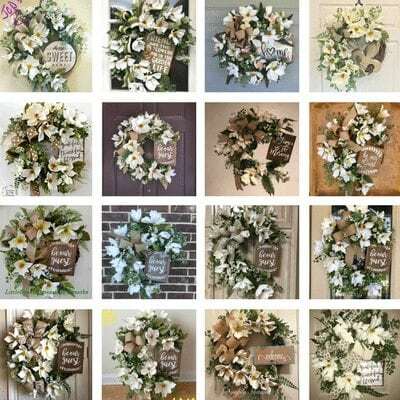 Just look at some of the wonderful creations my customer’s made using this video…and can you believe some of them have NEVER made a silk flower wreath before? That’s because of the outstanding instruction! This wreath is filled with silk flowers such as creamy magnolias, queen anne’s lace, ivy and of course Be Our Guest sign. 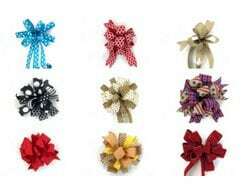 I also show you how to make a rustic, casual bow to finish this wreath off and make it very southern. A supply list so you know where I purchased my supplies! 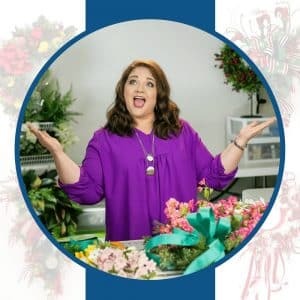 This video is filled with ideas producing a designer wreath and the close-up shots of each step ensures you know exactly what to do. This is a digital video, which means you can be watching it minutes from now! As soon as you purchase, you will be given a link to download the supplies list and instructions for streaming your video online. You can stream the video online as often as you need ensuring you don’t lose it if your computer crashes. 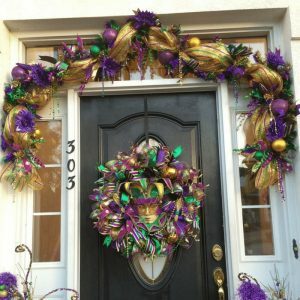 Can you imagine the door envy your neighbors will have when they see this stunning designer Magnolia Wreath hanging on your door? This video is only available for a limited time. Don’t miss getting a copy for yourself!